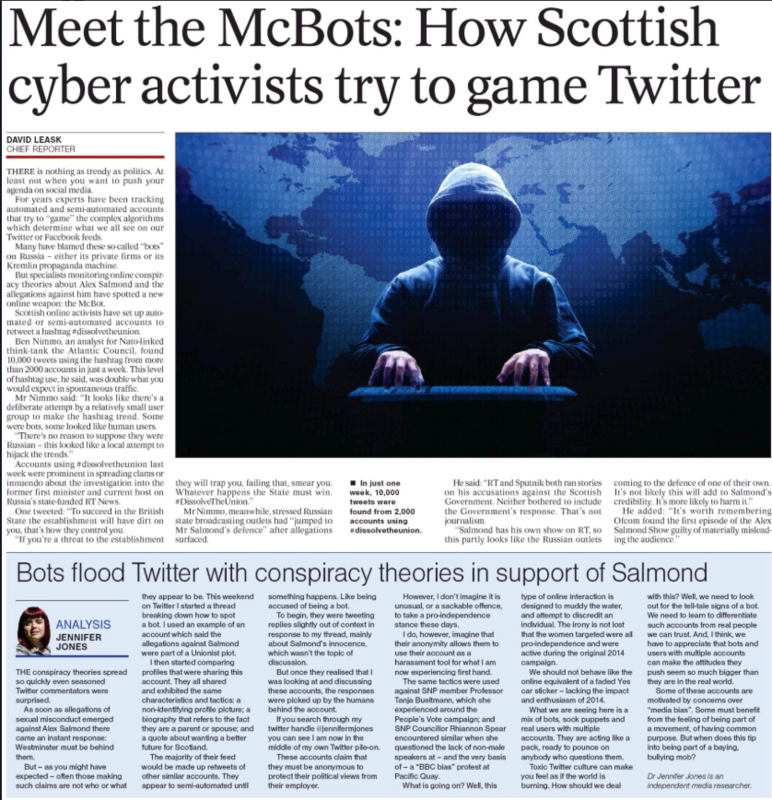 We know for certain that the Integrity Initiative targets Scottish Nationalists, because two of its luminaries, otherwise unconnected to each other, David Leask and Ben Nimmo, collaborated on a massive attack piece in the Herald identifying individual SNP supporters as “Russian Bots”. 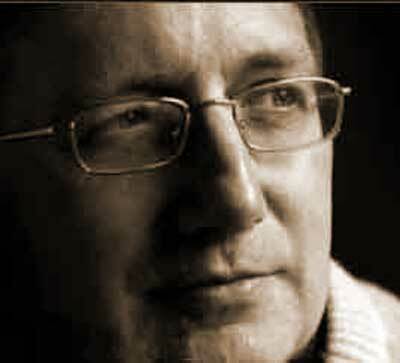 Ben Nimmo works for the Atlantic Council, funded inter alia by NATO. He is also on a retainer of £2,500 per month from the Integrity Initiative, in addition to payments for individual pieces of work. For his attack on Scottish Nationalists Nimmo was therefore paid by the Atlantic Council (your taxes through NATO), by the Integrity Initiative (your taxes) and by the Herald (thankfully shortly going bankrupt). Leask claims to have received nothing but a cheese sandwich from the Integrity Initiative, but has briefed them in detail on Scottish nationalism, attended their seminars, and they have included Leask’s output in their “outcomes” reports to the Foreign and Commonwealth Office (on which more in a few days’ time). I took apart Leask and Nimmo’s horrendous attack at the time, revealing among other things that one of Nimmo’s criteria for spotting a Russian bot or troll was use of the phrase cui bono. Nimmo’s role as witchfinder-general for Russian Bots appears very remunerative. 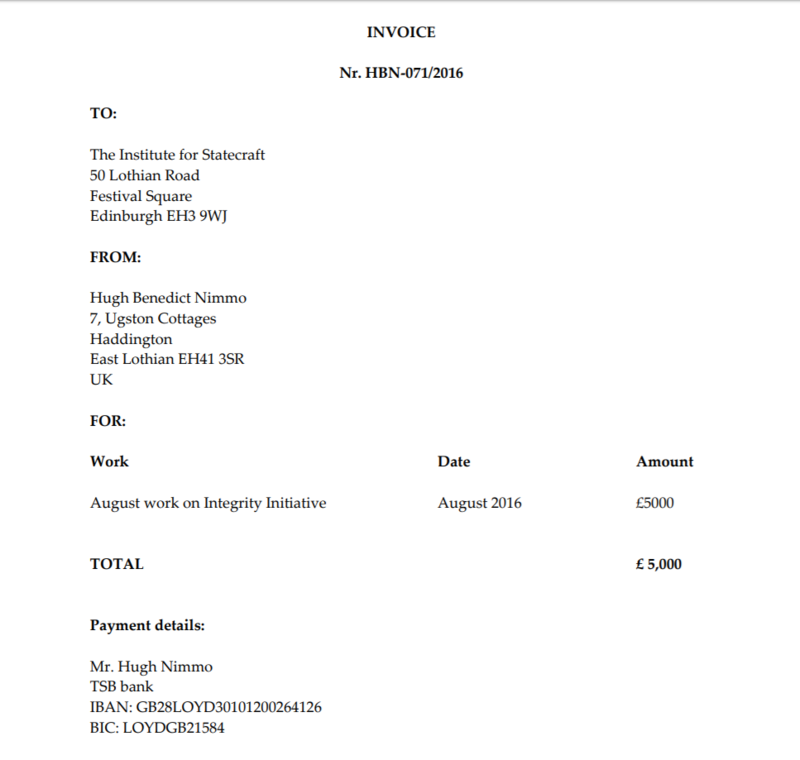 His August 2016 invoice to The Institute for Statecraft, apparently the 71st invoice he had issued to various neo-con bodies that year, was for £5,000. It is interesting that rather than sort code and account number, his invoice gives IBAN and BIC, used for payments coming from abroad.  Mainstream politicians don‟t want to challenge the fringe normally but they’re starting to. Stewart McDonald (defence spokesman) pitching NATO – “friends in Norway, Balts etc are in it”. SNP foreign policy chiefs have very anti-Kremlin, anti-RT, pro-Ukraine rhetoric.  Immigration not an issue in Scotland.  SNP going to Ukraine – to reassure allies they are not pro-Russian. I am afraid Leask is not wrong. The continual willingness of the SNP leadership to endorse Britnat anti-Russian rhetoric without question is a nagging worry for many nationalists. 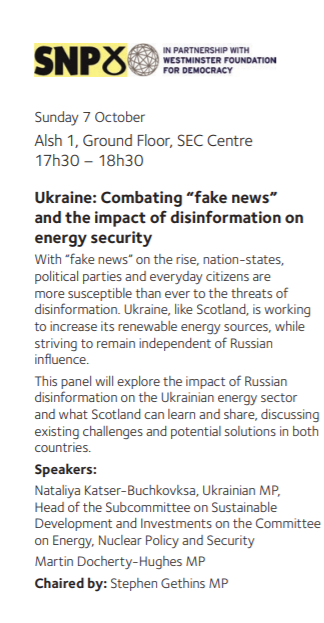 Precisely the same department of the Foreign and Commonwealth Office which funds the Integrity Initiative, funds the Westminster Foundation for Democracy which paid for this joint Britnat/SNP leadership group event at the last SNP Conference, featuring a Ukrainian politician also used by the Integrity Initiative. Read that carefully, and note that it is not just a discussion on the Ukraine – no harm in that – but one which is openly anti-Russian. The very title, on countering Russian disinformation, is literally straight out of the Integrity Initative’s handbook. Two SNP MP’s took part, including the foreign policy spokesman. Remember that meeting was on the conference fringe at which I was not permitted to hold a meeting on preparing for Indyref II. An awful lot of Nicola loyalists tell me that, in appearing at present to be much more interested in keeping the entire UK in the EU, rather than striking for Scottish Independence, the leadership are playing a brilliant tactical game. So what do we have here? We have a programme, the Integrity Initiative, whose entire purpose is to pump out covert disinformation against Russia, through social media and news stories secretly paid for by the British government. 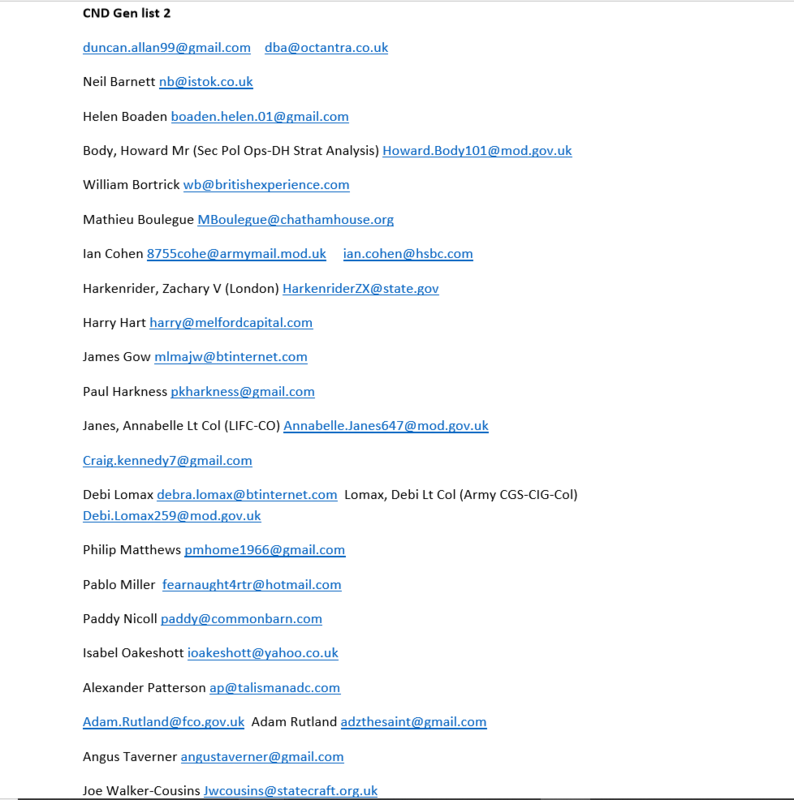 And we have the Skripals’ MI6 handler, the BBC, Porton Down, the FCO, the MOD and the US Embassy, working together in a group under the auspices of the Integrity Initiative. The Skripal Case happened to occur shortly after a massive increase in the Integrity Initiative’s budget and activity, which itself was a small part of a British Government decision to ramp up a major information war against Russia. The London Supreme Court last week not only confirmed that the Westminster Parliament could overrule at will any Scottish Government legislation, irrespective of the Scotland Act and the Sewell Convention, but it also ruled that Westminster had already successfully done so, by retrospectively passing provisions in the EU (Withdrawal) Act that overruled the Bill on the same subject, within the competence of the Scottish Parliament, that had already been passed by Holyrood. Not content with that, the London Supreme Court confirmed that London ministers may, by secondary legislation, under the Scotland Act decree laws for Scotland that are not even passed through the Westminster parliament. Which leaves Scotland in this extraordinary situation. English MPs or English ministers in their London Parliament can, at any time, impose any legislation they choose on Scotland, overriding Scotland’s parliament and Scotland’s representation in the London parliament. Yet, under the English Votes for English Laws rules of the London Parliament introduced by the Tories in 2015, Scottish MPs cannot vote at all on matters solely affecting England. 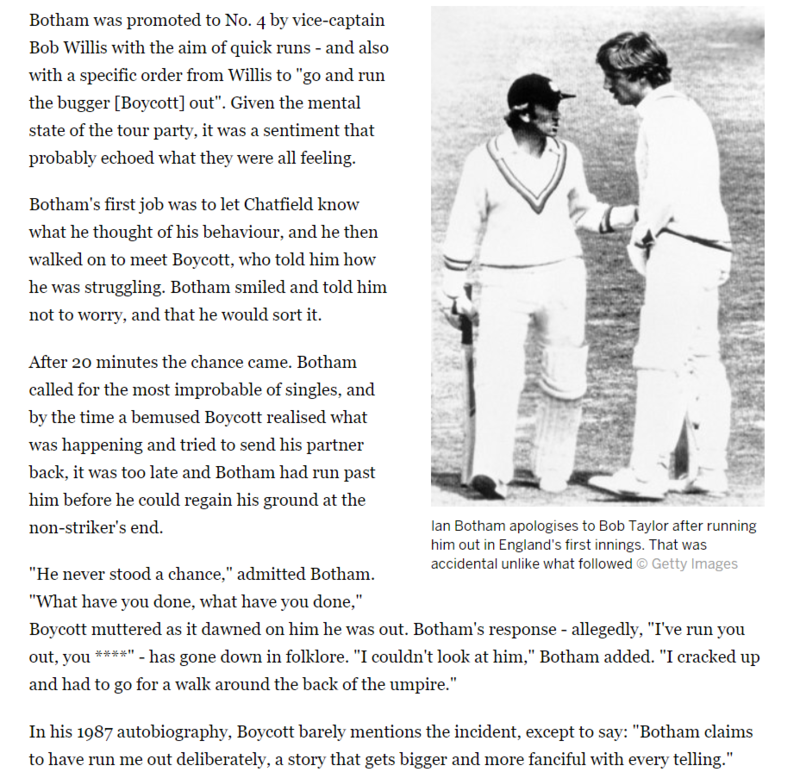 That is plainly a situation of colonial subservience. I am firmly of the view that the Scottish government should now move to withdraw from the Treaty of Union. Scotland’s right to self determination is inalienable. It cannot be signed away forever or restricted by past decisions. State‟s law will not have been complied with: that is true almost as a matter of definition. which the secession is occurring. the scope of already conferred power. That is a commendably concise and accurate description of the legal position. Of major relevance, it is the legal opinion of the Government of the United Kingdom, as submitted to the International Court of Justice in the Kosovo case. The International Court of Justice endorsed this view, so it is both established law and the opinion of the British Government that the Scottish Government has the right to declare Independence without the agreement or permission of London and completely irrespective of the London Supreme Court. entities only exceptionally and where expressly indicated. As I have stressed, the SNP should now be making a massive effort to prepare other countries, especially in the EU and in the developing world, to recognise Scotland when the moment comes. There is no task more important. There is a worrying lack of activity in this area. It may currently not be possible to spend government money on sending out envoys for this task, but if personal envoys were endorsed by the First Minister they would get access and could easily be crowd funded by the Independence Movement. I am one of a number of former senior British diplomats who would happily undertake this work without pay. We should be lobbying not just the EU but every country in Africa, Asia and South America. My preferred route to Independence is this. The Scottish Parliament should immediately legislate for a new Independence referendum. The London Government will attempt to block it. The Scottish Parliament should then convene a National Assembly of all nationally elected Scottish representatives – MSPs, MPs and MEPs. That National Assembly should declare Independence, appeal to other countries for recognition, reach agreements with the rump UK and organise a confirmatory plebiscite. That is legal, democratic and consistent with normal international practice. There will never be a better time than now for Scotland to become an Independent, normal, nation once again. 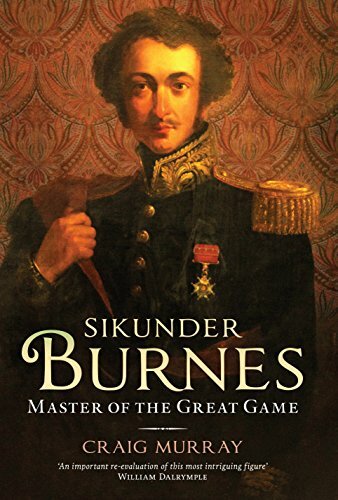 It is no time for faint hearts or haverers; we must seize the moment. Regular readers know I have largely steered clear of discussing Brexit for the three years its possibility then prospect has dominated the UK political agenda. I used to be enthusiastically pro-EU, as part of my general outlook of supporting international law and organisations. I was however shocked, deeply, by the enthusiastic support of all three institutional strands – council, commission and parliament – for the appalling Francoist paramilitary violence in Catalonia, and decided that the EU is no longer an institution I can support. The increasingly illiberal developments of the EU’s Third Pillar – including the abuse of arrest warrant procedure against Julian Assange and the internationalising of “Prevent” style Islamophobia – had already increasingly been worrying me. My reservations about the EU are therefore different to those of many. I particularly bemoan the loss of Freedom of Movement which I believe to have been one of the greatest achievements of civilisation in my lifetime. I remain incensed at the success of the elite in conning the deprived that their poverty is caused by immigrants, whereas it is caused by massive inequality of wealth. So I am conflicted on Brexit, but on balance would prefer to leave but stay part of the single market, thus retaining freedom of movement. My personal preferences aside, there is plainly a huge majority against leaving the EU in Scotland, so for Scotland to leave the EU at all at present would be wrong. It is my profound hope that the SNP will find the courage shortly to move on towards Independence. Having a nuanced view on Brexit is not in the least fashionable at the moment, when the media are whipping up a climate of extreme division. It is very plain that Tony Blair and the Blairites see Brexit, and the growing stock of the People’s Vote campaign, as a rehabilitation opportunity for discredited war criminals – war criminals who have to date avoided punishment. That the Blairites succeed in smuggling themselves back into political power via the People’s Vote campaign is the biggest danger in the entire process. Tony Blair yesterday made a speech on the People’s Vote platform at the Royal Academy, widely reported. Who exactly is running the People’s Vote and why are they giving a platform to Tony Blair? Three days ago it was Margaret Beckett representing the People’s Vote, and on Newsnight last week Peter Mandelson. It is like plunging into a recurring nightmare. Today we have a completely deranged – even by Nick Cohen’s standards – attack on Jeremy Corbyn in the Guardian/Observer, on this issue. And on Marr we had the deeply odious Chuka Umunna. The major reason that Remain lost the referendum campaign in England and Wales is that the Remain campaign was fronted by the most detested and discredited politicians in the UK: Blair, Brown, Cameron, Clegg, Mandelson, Osborne, and Kinnock and Straw jr. There is nothing these people could propose which would not be rejected out of hand by huge numbers, just at the sight of them. The question arises, who are “the People’s Vote” and who agreed that Tony Blair speaks for them? My strong belief is that a large majority of the 700,000 who marched through London would regard Blair as a war criminal and be horrified. Plainly, the People’s Vote does not in any sense belong to the People as a campaign but is being controlled by the New Labour war criminal elite, who see it as a chance to redeem their loss of political power. My disinterested advice to Remain supporters, if they wish to win a second referendum, is for “the People” to wrest control of “the People’s Vote” from the self-appointed war criminal friendly clique currently running it, to ditch the war criminals and to lead with Caroline Lucas. If the People’s Vote is really – as it seems to be – the Blair Bandwagon, it will crash into the buffers of entirely well-merited public distrust. England and Wales voted for Brexit 53.3% to 46.7%. I do wish Sturgeon would accept – as every genuine believer in Scottish Independence should accept – that the vote in England and Wales is no business of us here in Scotland, and leave the English and Welsh to it. Sturgeon should be working for nothing else but Scottish Independence, which is the way to honour Scotland’s clear vote to Remain. London’s Supreme Court, sitting in judgement on its Scottish colony, has ruled that parts of the Scottish Government’s UK Withdrawal from the European Union (Legal Continuity) (Scotland) Bill exceed the powers of the Scottish Parliament. The judgement is absolutely specific that the Scottish Bill breaches both the Scotland Act, the original devolution settlement, and the Tory/DUP government’s recent European Union (Withdrawal) Act, which rolled back devolution, grabbed powers from the Scottish Parliament over previously devolved areas and wrenched them back to Westminster. The Tory/DUP European Union (Withdrawal) Act Schedule 4 specified that it overruled the Scotland Act devolution settlement. If you carefully read the judgement, especially paras 47 to 65, the Supreme Court has gone still further than ever before in saying that neither the Scotland Act nor the Sewell Convention in any way limits the power of the UK Parliament to legislate for Scotland, even in devolved areas, without any need for consent from Scottish ministers or parliament. They even go so far as to specifically state that London ministers have an untrammelled power under the Scotland Act, without needing consent from Scotland or specific further endorsement from the Westminster parliament, to impose secondary legislation on Scotland. That conclusion is not altered by the other arguments advanced by the Lord Advocate. In relation to the first argument (para 47 above), a provision which made the effect of laws made by the UK Parliament for Scotland conditional on the consent of the Scottish Ministers, unless it disapplied or repealed the provision in question, would for that very reason be inconsistent with the continued recognition of its unqualified sovereignty, and therefore tantamount to an amendment of section 28(7) of the Scotland Act. In relation to the second argument (para 48 above), the question before the court is whether, if the Bill were to receive Royal Assent, section 17 would be law. If not, there would be no question of its having to be disapplied or repealed by the UK Parliament: it would be of no legal effect whatsoever (“not law”, in terms of section 29(1) of the Scotland Act). It is therefore no answer to an argument that section 17 of the Bill would be outside legislative competence, to say that it could be disapplied or repealed. In relation to the third argument (para 49 above), this submission resembles the Lord Advocate’s first argument, and for similar reasons we are unable to accept it. A provision which imposes a condition on the legal effect of laws made by the UK Parliament, in so far as they apply to Scotland, is in conflict with the continuation of its sovereign power to make laws for Scotland, and is therefore equivalent to the amendment of section 28(7) of the Scotland Act. What is the effect of the UK Withdrawal Act on the legislative competence of the Scottish Parliament in relation to the Scottish Bill? The UK Withdrawal Act is not a reserved matter but it is protected against modification under Schedule 4 . Several provisions of the Scottish Bill in whole or in part amount to modifications of the UK Withdrawal Act. These are: section 2(2) ; section 5 ; section 7(2)(b) and 7(3) [103-104]; section 8(2) ; section 9A ; section 9B ; section 10(2), 10(3)(a) and 10(4)(a) [108-110]; section 11 [111-113]; section 13B, section 14, section 14A, section 15, section 16, section 19(1) and section 22 (to the extent that these provisions relate to section 11) [114-118, 120-121]; section 26A(6) ; and section 33 and Schedule 1 paragraphs 11(a) and 16 [123-124]. The judgement is as expected and reaffirms Scotland’s colonial status and the London view that the Scotland Act did not recognise any inherent Scottish rights, but rather graciously handed down from above some powers that London may change at a whim, exactly as though Scotland were an English County Council. Given all this, the part of the judgement which states that it was not in itself outside the competence of the Scottish Parliament to pass a bill which relates solely to the domestic effects of EU withdrawal, is a very small victory indeed – and utterly irrelevant in the wider scheme of things. Anybody in the SNP today touting this judgement as a victory, has either not read it, or is worryingly comfortable with vassal status inside the UK Establishment. Devolution is not just a sop, it is a trap. It is a device by which the SNP has its energies sapped dry in a Herculean effort to maintain Scottish services and public welfare while being perpetually undercut by Tory austerity. The Scottish government are trying to defend the Scottish people with both hands tied behind their backs, while a unified Tory media attacks them relentlessly for every public service failure in Scotland, as though the Tories were not the cause. Not only was the Vow of increased powers for the Scottish Parliament, which turned the tide of the 2014 referendum on Independence, an abject lie; what the Supreme Court has affirmed is that the English Tories and Northern Irish unionists can strip powers from the Scottish Parliament at will. What the Supreme Court have done today is to provide crystal clarity that Scotland has but two choices; complete subservience to Tory England or Independence. All else is fiction. I have only ever been able to discern two underlying motivations in Theresa May’s career; a love of office and a hatred of immigrants. It is possible to love office without loving power; loving power means you want to do something with it, whereas loving office is just for prestige and personal economic opportunity. I do not imagine May’s hatred of immigrants is driven by actual racism, easy though it is to read that into her hostile environment, go home van, end free movement, career. It is rather that the incredibly successful Tory narrative remains the false attribution of working class poverty to immigration, rather than its actual cause, massive inequality and an entire legal structure and system of government geared to promoting the interests of the super wealthy. The BBC TV News was hyping the success of the British economy under Theresa May a couple of days ago on the basis of figures from the Office of National Statistics showing that the economic inactivity rate had fallen to 21%, the lowest since records began. But that needs to be considered alongside the fact that purchasing power of average wages is still below where it was ten years ago, and a huge swathe of the population is in insecure, part time and low paid employment. The decline of leisure is not something to be celebrated. The shrinking of the “economically inactive” figure to 21% means that many pensioners are forced to keep on working because they cannot make ends meet on the developed world’s most miserly pensions, that parents of young children are forced both to stay in jobs rather than provide all the love, protection and affection they may wish. Every time Theresa May is questioned on the heartless fiasco of universal credit, she states its aim is to “get people back into work”, by which she means choose between starvation and vicious drudgery; with no rights, no prospects and low paid hours handed down as a favour.